The Ave Maria Money Market Account gives you the opportunity to invest for short-term savings through the convenience of Government Obligations Tax-Managed Fund. This money market mutual fund invests exclusively in the highest-quality short-term U.S. government money market securities and conforms to Ave Maria Mutual Funds’ morally responsible guidelines. A competitive daily interest rate, daily access to your money, and seeks to maintain a stable $1 share price. The convenience of checkwriting, so you can withdraw money from your account to pay bills by simply writing a check. Ave Maria Mutual Funds are managed by Schwartz Investment Counsel, Inc., an investment adviser who has been providing investment counsel to institutions and individuals since 1980 and today serves investors nationwide. Schwartz Investment Counsel, Inc. selected the Government Obligations Tax-Managed Fund for this program because its investments are congruent with the moral standards in place across Ave Maria Mutual Funds. The money market fund is managed by a subsidiary of Federated Investors, one of America’s largest and most respected money fund managers. Prospective investors should read the prospectus carefully and consider the fund’s investment objectives, risks, charges, and expenses carefully before investing. The prospectus, which can be obtained by calling 1-866-AVE-MARIA or downloaded from this website here, contains this and other information. 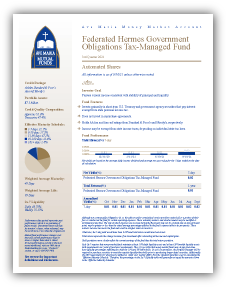 Federated Securities Corp. is the distributor of Government Obligations Tax-Managed Fund. Ultimus Fund Distributors, LLC is the distributor of the Ave Maria Funds.